These poor chairs were still very study, but the fabric was nubby, pilled and stained. I love a good challenge, so I took all three of the chairs home over the Christmas break. The first task involved removing the seats. Before I touched the seats, I flipped over the chairs and marked the front side of the chair so they would fit together perfectly when I put them back together. Because of the construction of these chairs, I found it necessary to use a longer bit on my drill to get into each hole. I pried off the piping from the seat backs with a 5-in-1 painter’s tool and needle-nosed pliers. After the seats were removed, each chair got a good cleaning, a little sanding and then a couple coats of Miss Mustard Seed Milk Paint (colors used: tricycle and luckett’s green) and the blue one was chalk painted. 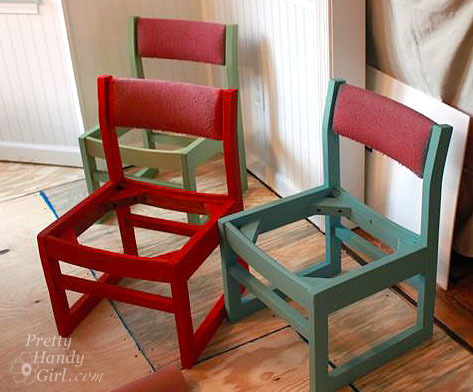 I used the bonding agent with the milk paint to make sure the paint would stick to the chairs. Finally, the chairs each got two coats of Minwax Polycrylic because those kindergartners are tough on furniture. I let my son’s teacher to pick out some cute fabrics from one of my favorite fabric sources, Spoonflower.com. Not only do they have loads of designs to choose from, but you can also upload your own graphics and create your own custom fabric! She picked out these adorable space themed fabrics: Rocketship fabric and Space Fireworks fabric. With a primary color palette, they are the perfect choice for a kindergarten classroom. Cut out fabric, oil-cloth (optional) and batting a few inches larger than the seat. 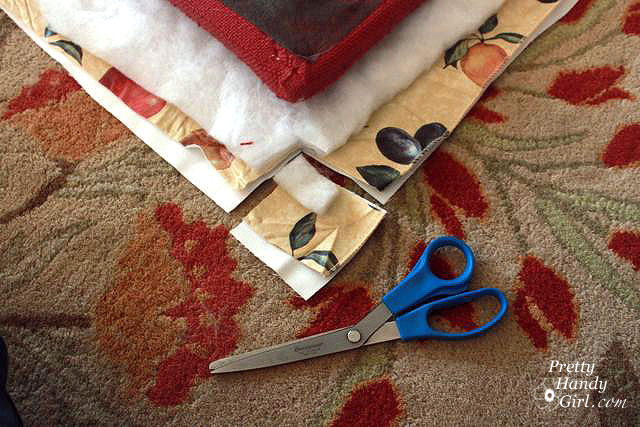 Cut a square out of each corner about 1″ from the seat cushion corner. Staple one staple into the center of each side. Work across form each other, gently stretching the fabric taut. Add more staples along each side. Corners are neatly folded and then stapled to secure them. Hammer any staples that didn’t go completely into the bottom of the seat. Re-attach the seat to the chair frame by replacing all the screws. Flip the chair right side up and (1) layer batting, then fabric over the chair back. Cut the fabric about an inch wider on the two sides and the bottom. (2) Trim the batting to fit perfectly on the seat back. (3) Fold under the raw edges of the fabric. (4) Secure the fabric to the chair back by stapling at the top of both sides first. 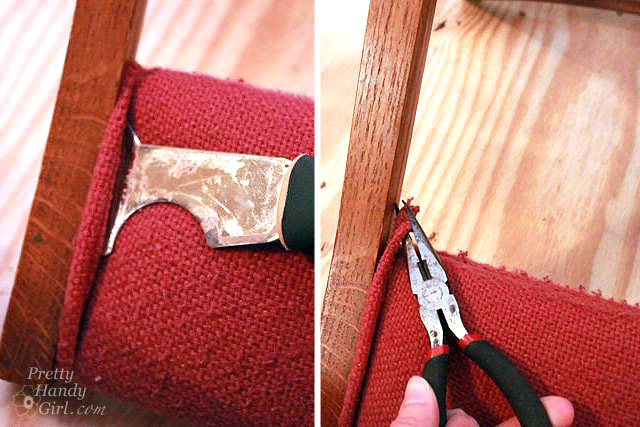 Continue stapling the fabric to the chair along the sides. Set your staples as close to the frame as possible so the piping will hide your staples later. Hammer any staples that stick up. If you haven’t done so already, sew your piping following this tutorial. Trim the excess fabric from the piping. Peel back the ends of the piping fabric to expose about an inch of the rope inside. Cut the rope. Then fold the fabric back and tuck the raw edges inside. This will give you a flat section at the end of your piping. (1) Staple this flat end to the underside of the chair back. 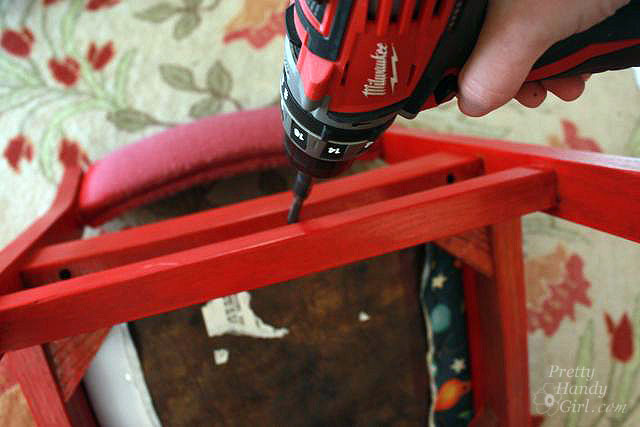 (2) Spread some hot glue on top of the staples along the side of the chair back. (3) Pull the piping taut and press it into the hot glue. (4) Secure the end of the piping with hot glue and a staple. Secure the piping to the opposite side using the same method. Check out this sweet new chair! Would you know that it was the same chair if I hadn’t shown you? Good, let’s keep it our little secret ;-). The chairs were such a big hit with the kids. They all rushed to be the first to sit on them. I think their teacher was happy with the finished product too. It’s a happy trio of kindergarten chairs! Super cute!! They turned out so cute!! The kids are blessed to have you redo their chairs. Love the pattern!! love it! 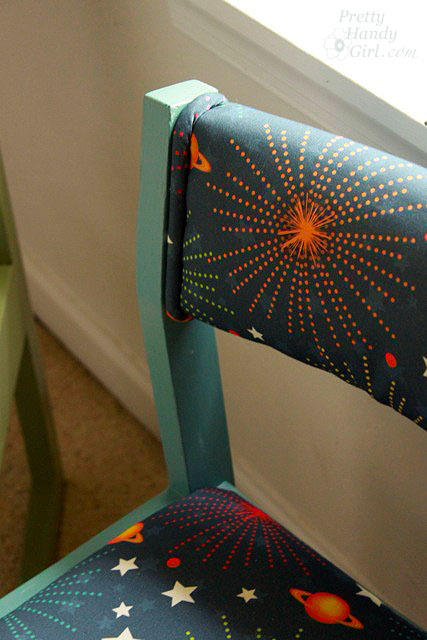 These chairs totally belong in my kids outer space bedroom! Great job! They look so bright and cheery!! What a difference!! I’ve done that kind of work, pre-digital photos days’ I’ll have to see if I can fine those photos. If I do I’ll have to post. It’s hard work but so worth it. You have no idea how much you just helped with the kindergarten chairs. Such a simple process but for some reason i am too scared to tackle my dining chair because of the back piece but i think i am ready now, THANK YOU! We do truly love them! They are as bright and beautiful as they appear! Brittany, those chairs look great! Thanks for showing how you did it. Cute, cute chairs!